5793 labyrinths found. Showing 3581-3600. Sorted by country, state, city, then zip/postal code. 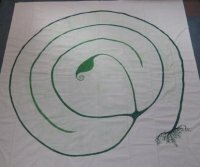 5-circuit medieval variation based on the 5 inner circuits of the Chartres cathedral labyrinth. 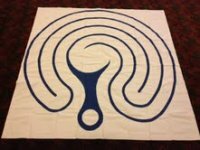 5 circuit medieval design, based on the labyrinth in Riverside Church, NY. 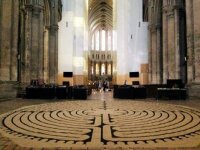 The labyrinth shown in the Chartres Cathedral, France. 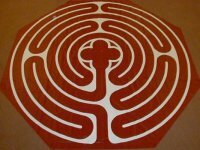 Chartres replica, painted to replicate the actual stone pavement labyrinth at the cathedral in Chartres, France, including stone blemishes. It was initially made to be used at Chartres while the pavement labyrinth was closed for cathedral restoration. 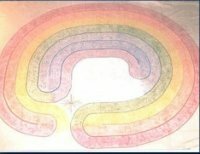 This labyrinth is installed for workshops primarily at the University of Minnesota Equine Center in St. Paul, MN, but can be used in other locations. 5-circuit classical that can be configured as a dual mirrored pattern pass-through design with separate entrance and exit. It is designed for use with horses. 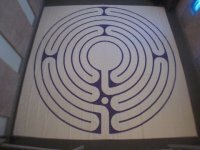 One of several portable labyrinths available for rental. Backyard three circuit garden labyrinth. 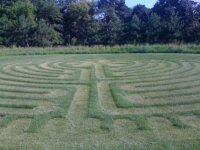 Labyrinth is located on the north side of the church building.